For mezzo-soprano, choir, and historic wind quintet (2 cornets, 2 sackbuts, dulcian) on a poem by Robert Service. 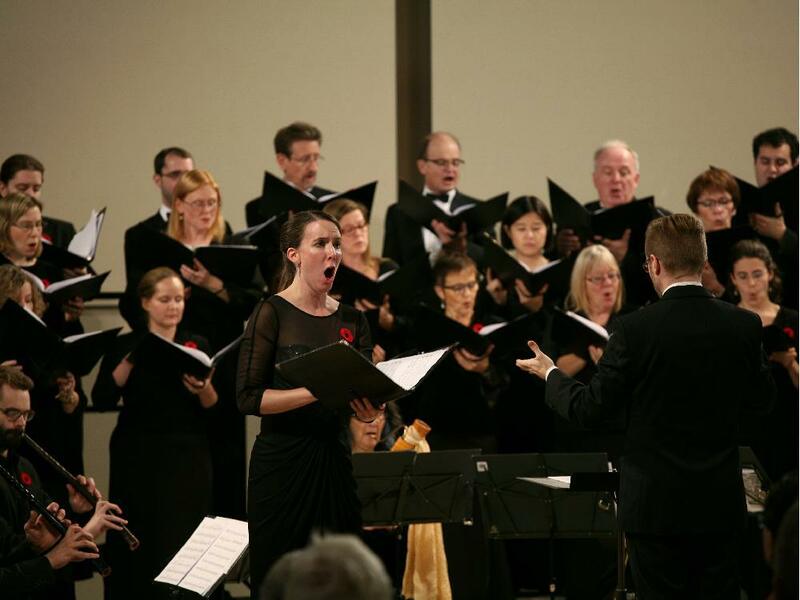 First performance: 2 November 2014 with Meagan Zantingh, mezzo-soprano, La Rose des Vents, and the Cantata Singers of Ottawa, Christopher Hossfeld conducting. Hossfeld’s own work, In Pace, was the program’s keystone. Set to a gut-wrenching poem by Canadian Robert Service, it’s a first-person account of a soldier dying on a WWI battlefield. Hossfeld paints in a harrowing palette of minor seconds and sinuous, uneasy motifs, eschewing the obvious military references. Boldly, he gives the soldier’s lines to a mezzo soprano.… Hossfeld’s conducting is clear and calm. Natasha Gauthier. “Lost lives and lost manuscripts featured at two weekend concerts.” Ottawa Citizen, 2 November 2014. Written in commemoration of the First World War centenary. In creating this piece, I contemplated the loss and tragedy of the First World War, and how to relate them to a modern Canadian audience. In searching for a Canadian poet with first-hand experience of the war, I came across the work of Robert Service (1874–1958), who was an ambulance driver and stretcher-bearer for the Red Cross. His poem “On the Wire” is from a collection of poetry, Rhymes of a Red Cross Man, published in 1916. It describes the horror of a soldier, trapped on the barbed wire that marked the front lines of the trenches, who eventually takes his own life to relieve his agony. The role of the soldier is sung by the mezzo-soprano soloist. The challenge of setting a poem full of such horrific descriptions is finding a context for it: dwell too much on the terror, and it can be an awful experience for the audience, but avoiding it might end up trivializing it. I found the answer in an antiphon and a hymn taken from the Compline service for the first Sunday of Lent. Compline is a service sung at the end of the day. Its prayers for protection through the night often evoke images of the end of life as well. There are haunting parallels between the latin text and Service’s poem, especially the imagery of light and petitions for protection. The antiphon text, In pace, is set by English composer John Sheppard (1515–1558), alternating polyphony with the chant. The motet is quoted in its entirety at the end of my piece, the choir singing the chant and the winds playing the polyphony. Its accompanying hymn, Christe qui lux es et dies, is sung by the choir through the rest of the piece, acting as a Greek chorus praying for the soldier. It’s burning me, scorching me up. God, can’t You hear my cry? It’s laughing, the cursed sun! It’s parching my very moans. For you proclaim the blessed light. Why must I suffer so? Is it God doesn’t care? Is it God doesn’t know? Clean in the clash of the fight! Grant us a tranquil night. Hasten, O God, Thy night! I can’t believe that it’s mine. And make us guilty in your sight. Lo! it is night at last. Keep our hearts forever awake to you. Night! but the guns roar out. Night! but the hosts attack. Restrain those that lie in wait. You have ransomed with your blood. Close to me, close … Oh, hark! Someone moans in the dark. Again, and I’ve not yet gone. The man whom I heard is dead. A pistol gripped in his hand. Be near us, O Lord. Will never know how I die! To do without shame this thing. I shall sleep and rest. English text by Robert W. Service, “On the Wire” from Rhymes of a Red Cross Man (1916). Latin text from the Sarum Compline service for the First Sunday of Lent (Hymn and Antiphon).